Residents who are struggling with their home heating bills should apply for assistance from the Low-Income Home Energy Assistance Program (LIHEAP) before Friday, April 6, when the program closes. The income eligibility guidelines for LIHEAP are set at 150 percent of the federal poverty income level. For example, the income limit for an individual is $18,090; for a couple, the limit is $24,360; and for a family of four, it is $36,900. PennDOT is offering new Motorcycle Safety Program (PAMSP) clinics in 2018 that are designed to focus on developing operator proficiency among prospective, experienced and new Pennsylvania riders. Clinics are offered free of charge to Pennsylvania residents who have a motorcycle learner’s permit or motorcycle license. PAMSP will offer five revamped training syllabuses tailored not just to hone riders’ knowledge, but to test their ability to physically manipulate a motorcycle properly. All training clinics are conducted under the supervision of certified instructors at one of numerous riding ranges located throughout the state. Three of the clinics – the Beginning Rider Clinic (BRC), the Intermediate Riding Clinic (IRC) and the 3-Wheel Riding Clinic (3WRC) – offer a pathway to earning a motorcycle license. Act 84 of 2012 requires that all permit holders under age 18 successfully complete the BRC to receive their motorcycle license. For more information or to enroll in a clinic, visit www.pamsp.com or call 1-800-845-9533. Citing the lack of rural broadband as an impediment to economic development, the House Majority Policy Committee will hold a hearing on the topic on Thursday, April 5. Testifiers at this hearing are expected to discuss ways in which the absence of high-speed internet access is holding back local economies, provide an update on the long-range plans of providers and discuss emerging technologies that could help solve the problem. Those expected to offer testimony will include representatives from the following organizations: Central Bradford Progress Authority, Soil Services, Endless Mountains Health Systems Inc., Wayne County Board of Commissioners, Pennsylvania Telephone Association, Broadband Cable Association of Pennsylvania, Verizon and Microsoft. Barring any technical difficulties, the hearing will be streamed online at www.pagoppolicy.com. 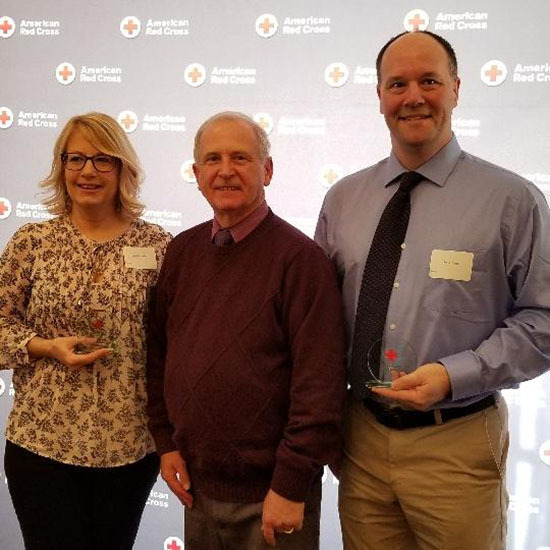 It was my pleasure to attend the American Red Cross North Central PA Chapter Heroes Recognition event on Friday, March 23. 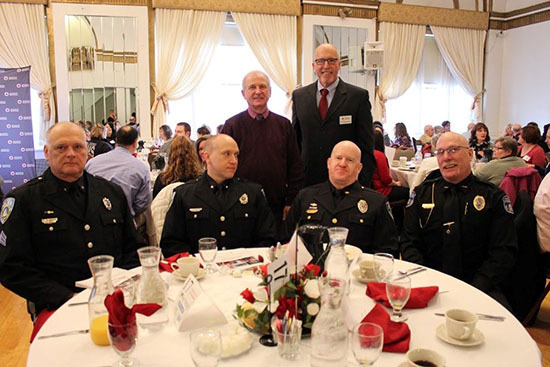 Award winners in the 109th District included the Bloomsburg Police Department, as well as Camille Laubach and Mike Riegel of the Berwick YMCA. Congratulations! Pictured with me are members of the Bloomsburg Police Department. 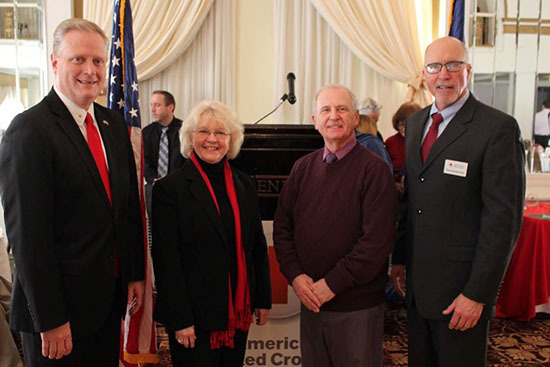 Pictured with me are Reps. Fred Keller and Tina Pickett, and Tom Szulanczyk, executive director of the American Red Cross North Central PA Chapter. Pictured with me are Camille Laubach and Mike Riegel of the Berwick YMCA. • George Difebo - Grand Lodge special commendation. • Cathy D’Ambrosio - Elk of the Year. • Mike Monico - Citizen of the Year. • Krunal Thakore - Officer of the Year. • Jeff Demler - Grand Lodge special commendation. • Using a cell phone while driving increases your risk of a crash by four times, whether or not it is hands free. • The simple act of dialing a phone increases your crash risk by three times. • Sending or receiving a text, aside from being illegal in PA, takes a driver’s eye from the road for an average of 4.6 seconds. When traveling at 55 mph, that’s enough time to travel the length of a football field. • Drivers using cell phones look but fail to see up to 50 percent of the information in their driving environment. • And it’s not just cell phones. Eating, drinking, smoking, adjusting the radio, personal grooming and passengers are all distractions too. • According to a recent AAA study, six out of 10 teen crashes were caused by a distracted driver. AAA also reports that distraction contributes to more than 5,000 crash fatalities each year. • In Pennsylvania, 16,050 distracted driving crashes in PA resulted in 69 fatalities during 2016. Motorists are urged to pay attention behind the wheel and just drive. For more tips, visit http://www.penndot.gov/TravelInPA/Safety/TrafficSafetyAndDriverTopics/Pages/General-Driving-Safety.aspx. • Thursday, March 29, is Vietnam Veterans Day. • Benton High School will perform Once On This Island from Friday, April 6, through Sunday, April 8. • St. Luke’s in Bloomsburg will hold a craft/yard sale on Saturday, April 7, from 8 a.m. to 2 p.m.
• Visit us at the Children’s Fair at Columbia Mall on Saturday, April 7, from 10 a.m. to 2 p.m.
• Berwick YMCA will hold a Diva Day on Friday, April 13, from 6-9 p.m.
• Orangeville Fire Department will hold a Spring Craft Show on Saturday, April 21, from 9 a.m. to 2 p.m.
• Our Senior Caregivers Forum will be held at the Northern Columbia Community Center in Benton on Tuesday, April 24, from 10 a.m. to noon. Registration is required. Call (570) 387-0246 to register. • Our third Spring Drug Forum will be held at Benton High School on Tuesday, April 24, from 6-8 p.m.
• Monthly Radio Address: Thursday, April 26, at 8:30 a.m. on WHLM 94.7 FM. • The Renaissance Jamboree will be held in Bloomsburg on Saturday, April 28, from 10 a.m. to 5 p.m.
• The Berwick ALS Walk will be held at Crispin Field on Saturday, April 28, at 9 a.m.